This weekend we had a "stock the bar" couples shower to attend. I was a bit stumped as I didn't want to bring just a bottle of liquor and I didn't give myself enough time to have cocktail napkins monogrammed. And how many martini shakers can one get? Thankfully, I found a beautiful tall glass pitcher at Pottery Barn with the accompanying glass wand to stir and muddle. 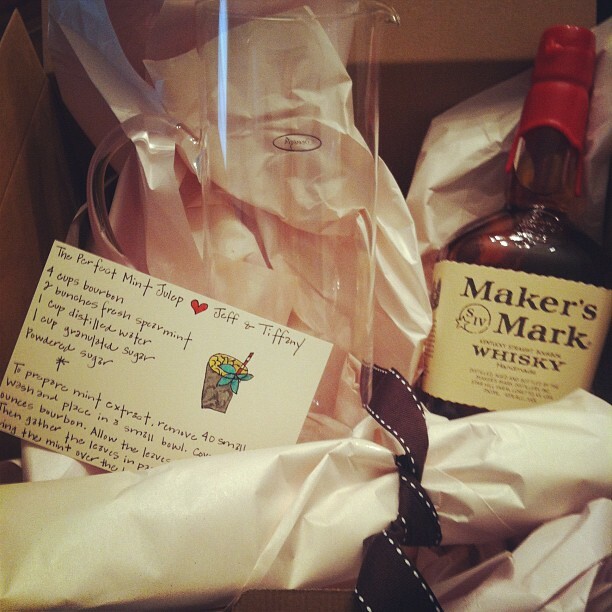 I included a bottle of bourbon and a recipe for The Perfect Mint Julep. We used this recipe for Stella's Kentucky Derby birthday party and they were a hit. Maker's Mark is the best. I live close to the historic distillery. Such a great gift idea. I love that you added the recipe. Perfect! I'm sure they were thrilled - can't go wrong with Maker's and a good mint julep!